Why don’t the Dutch wear bike helmets? The Dutch aren’t known for taking unnecessary risks. “Wild” or “reckless” aren’t words that come to mind when you think of the Dutch national character. Why then do they so often forego what many see as an essential piece of safety equipment: the bike helmet? That the Dutch love cycling is obvious. One third of all journeys in this country are taken by bike, and the average Dutchie cycles 2.5km per day. Cycling is second nature to the Dutch, and it’s not uncommon to see them managing to haul groceries, talk on the phone and smoke cigarettes, all while navigating city traffic on their bikes. 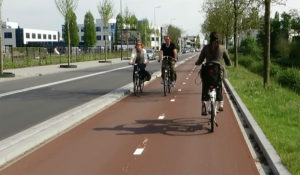 Cycling isn’t risk-free however, and just last year 185 cyclists were killed in traffic accidents in the Netherlands. Even a fall at low speed can cause serious fatal head injuries, and a collision with a moving car can mean instant death. Wearing a helmet can reduce the likelihood of a serious head injury by 70%, according to a major global study. Why then don’t the Dutch cover their beautiful blond hair with them? Perhaps they’ve been lulled into a false sense of security. Bike journeys are so common that the bicycle is like an extension of the Dutch person themselves. Getting on a bike isn’t the big song and dance that it is in other countries, it’s just normal here. Or maybe it’s the infrastructure. Cycle lanes in the Netherlands are always smooth and well maintained. Intersections are controlled by dedicated traffic lights for cyclists, and bike paths are usually well separated from the main flow of traffic. It helps too that cyclists are well protected by Dutch liability laws, which favor pedestrians over cyclists, and cyclists over motor vehicles by default. Knowing the legal implications of hitting a cyclist, drivers give them a wide berth. Contrast this with cycling somewhere like London or Dublin, where even commuting with a helmet on is a dice with death. These are all just guesses though. Maybe the Dutch really do get a kick out of risking injury on a daily basis. We asked a few Dutchies why they don’t put safety first and wear helmets. 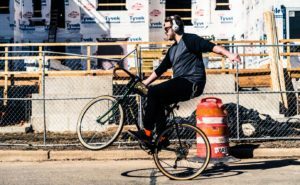 Karst, 27, Journalist – I never even consider wearing a helmet on my bike around town. Since I was five years old I would drive 12km a day to get to school and back. Luckily my parents never forced me to wear one, because you always felt sorry for the poor kids with overly concerned parents who had to wear helmets. On my race bike it’s a different story. I feel fragile because of the thin tires and because I’m attached to the pedals. You hear nasty stories of race cyclists crashing or getting hit by cars. A guy from my village would cycle to work on his sports bike and wore a helmet every day, except once. That day he crashed into a tree head first and didn’t survive. Sometimes when I forget my helmet I shiver when I see trees flying by and remind myself to wear it next time. Julia, 23, Student – Because we’re so good at it [biking]. The last time I fell I was in my junior year of high school and we were playing around on ice, so it wasn’t a surprise. Also, so many people cycle here that bike paths are separated from the roads, and even when they aren’t, drivers are always looking out for cyclists. Maria, 24, Student – Hair sweat? Also, I’ve fallen off my bike many times but never hit my head. You would have to fall really weirdly and have no control over your arms to fall head first. Is your article on how weird Germans are? Because I never understood why they do wear helmets. The Dutch have been cycling since they could walk, but what about expats? Plenty of foreigners coming here don’t have the same experience that the locals do. For some internationals, their stay in the Netherlands will be their first time on a bike since childhood, perhaps ever. If you’re concerned for your safety, perhaps it’s better to swallow your pride and wear a helmet. Having a functioning brain and an intact skull is worth the glances you’ll get on the street. When buying a helmet, make sure it fits snugly and bears the EN1078 safety mark. Helmets that meet this mark have been rigorously tested by being bashed against anvils and will keep your head safe in a collision. It’s worth noting that your helmet is only good for one crash. After taking one impact – even a drop that only cracks the shell – it needs to be replaced. Just one crash can weaken the helmet’s tensile strength and make it more likely to break apart next time. Whether you decide to wear a helmet or not in the Netherlands, stay safe out there!